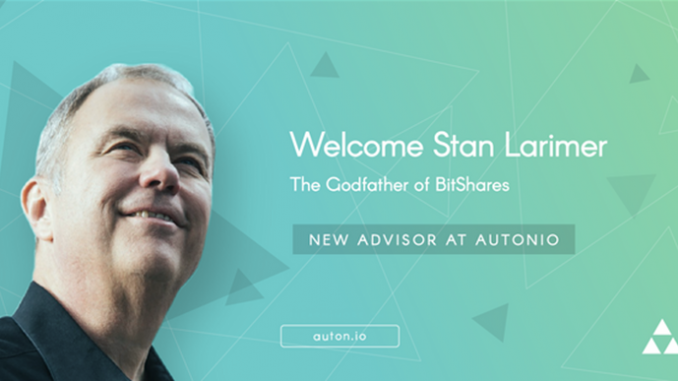 The Autonio team is proud to announce that Stanley Larimer (@stan) has joined Autonio’s advisory board. Stan will be working closely with the Autonio team to advise on the development of the NIOdex, assisting Autonio in developing their network within the cryptocurrency industry, and ensuring the humanitarian values of Prosperism remain an important influence on the project. Stan has four decades of experience in software, hardware, and systems engineering, program management, and business development. He contributed on 17 different R&D programs for air, ground, sea and space systems and has worked with major aerospace firms such as Boeing, Lockheed Martin, Northrop Grumman, and SAIC as consultant, tech lead, program manager and/or corporate officer. He currently serves as the President of Cryptonomex, a company that provides software development services to meet the growing demand for custom, high-performance blockchains and related technology. Stan and his son Dan have co-founded or developed several industry-leading blockchain projects through their company Cryptonomex. These ventures include blockchains such as Steemit and EOS. Stan is perhaps best known for his work with BitShares, which he founded in 2013. The BitShares platform itself is run and maintained by the BitShares community – an open consortium of individuals and organizations committed to providing universal access to the power of smart contracts. Working together, this community has designed and developed the BitShares platform to include numerous innovative features within the smart contract industry. Autonio, or Automated Nexus of Intelligent Operations, makes cryptocurrency trading readily accessible to users of any skill level. Autonio provides an artificial intelligence (AI) algorithmic trading ecosystem that can be accessed using the NIO token. Automated trading algorithms can be used to take advantage of the high volatility in the cryptocurrency markets, creating additional opportunities for users. The NIO Suite of products is a foundational toolset that bundles three flagship products for broad consumer use; AutoNIO, an automated trading platform; NIOdex, a decentralized exchange; and NIOnet, an AI-powered sentiment analysis tool. Please visit https://auton.io/ for more information.